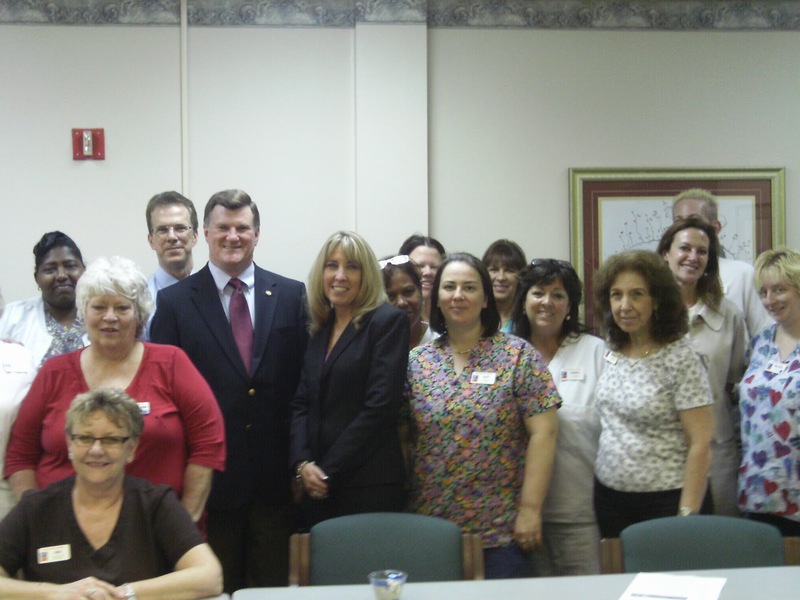 The same passion and skill nurses bring to their residents can be used to help make a difference in Florida's Capitol. FHCA kicked off its 2012 Nurse Leadership Program in St. Pete Beach today, encouraging nurse leaders in attendance to become advocates with Florida Health Care Association and help educate legislators about their contributions and the significance of what they do in caring for Florida's long term care residents and patients. Hear what these passionate caregivers have to say about getting involved and making a difference. On Monday, Rep. Gayle Harrell (R-81) toured Palm Garden of Port St. Lucie and took part in the facility's Tropical Day as part of their National Nursing Home Week celebration. Administrator Scott Cairns introduced her to residents and staff, giving her information about what they do at the facility and how the decisions made in Tallahassee affect the care they provide. The Representative shared with the group her belief in the family, her health care accomplishments and the challenges Floridians face going forward. She also helped present several nursing awards, after which Mr. Cairns presented her with an Honorary Angel tribute, asking her to be their Angel up in Tallahassee, to watch over them and keep the residents and staff in her thoughts when she is making important decisions. Beginning yesterday, May 13, through May 19, nursing homes across Florida and the nation will be Celebrating the Journey in honor of National Nursing Home Week 2012. Facilities have activities planned that will honor the lives - and milestones - of the people they care for and the staff who serve them. Celebrating the Journey reminds us that every life should be honored, every life’s story needs to be told and that every day we have the chance to begin writing a new chapter. Whether the day is filled with comedy or drama, nursing home residents and caregivers are co-authors and leading characters in each other’s life story. All of us should strive to live life to the fullest, irrespective of our age or medical condition. In the long term care profession, there is no fixed formula to follow, just the quiet routines of daily caregiving, meals, activities, and, hopefully, visits from family and friends. They bring the joy that comes from the heart of a loved one. Many of our Florida Health Care Association member nursing homes are embracing the Culture Change movement as a means to help residents live their lives to the fullest. Culture Change focuses on change from within. The purpose is to help improve residents’ quality of life with more choices and more involvement in the day-to-day planning of their activities. It is called “person-centered care” and is for all ages. Residents have more choices in meal selections and other activities of daily living. Additionally, the front line workers who provide the bulk of the care are being given greater autonomy with their assigned residents to encourage staffing consistencies and strong friendships with residents. During this special week, we’re reminded of Ralph Waldo Emerson’s famous sentiment that “life is a journey, not a destination.” Long term care professionals working in our state’s nursing homes have dedicated their careers to serving others. They understand that the experiences they share with residents and patients are truly a journey. Families and friends should take comfort in knowing that they are here for them every step of the way – when they are striving to maintain or build relationships amid memory loss or coming to terms with the challenges that come with growing older. Rest assured that all of us working in long term care have the same goal in Celebrating the Journey, and that is for residents to feel satisfied at the end of each day that staff cared for and about them – not just as patients - but as people with stories to tell and new chapters yet to write. FHCA members' active involvement in our grassroots initiatives is critical to advancing our legislative agenda. Staffing working in the facilities are the informed, on-the-ground experts that legislators are inclined to listen to, putting a local face on state issues. FHCA wants to encourage members to invite legislators in for a facility tour and the opportunity to meet residents and staff. Follow our posts to learn more about how our members are connecting with lawmakers this summer. Sen. Elizabeth Benequisto (R-27) visited Coral Trace Health Care Center. Administrator Tracy Hooks gave the Senator an extensive tour, after which she met with Resident Council members, as well as the facility's leadership team, to discuss a number of important long term care issues. 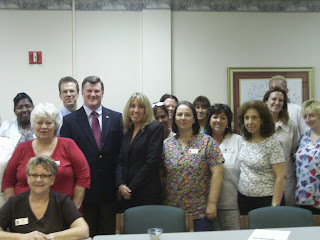 Rep. Jim Frishe (R-54) visited Palm Garden of Pinellas, where he toured the facility and met with residents and staff. Rep. Frishe was the House bill sponsor for HB 621 and was a tremendous help with the passage of HB 787, which will eliminate some duplicative paperwork and requirements. 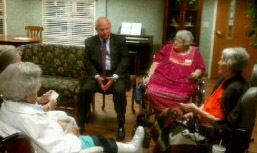 During his visit, he met with the facility's nurses, who cheered after he spoke about his role in getting these important provisions for nursing homes passed this session. Rep. Dennis Baxley (R-24) toured Palm Garden of Ocala, meeting with their medical director and visiting with residents and staff. He took time to answer residents' questions related to Medicaid funding and other broad health care issues, making for an informative visit. If you need assistance setting up a facility tour, communicating our long term care issues or getting involved in our grassroots advocacy in the months to come, please contact a member of FHCA's legislative team. The 2012 legislative session ended with several victories for long term care providers. FHCA worked diligently to help preserve nursing home Medicaid reimbursement rates and pass legislation which contains important provisions that will offer member facilities regulatory relief, giving staff more time to focus on resident care. This special Provider Program features an in-depth interview with the members of FHCA’s legislative team, including a review of 2012 session outcomes and a discussion of the top issues that we expect to be addressed among the 2013 Legislature, including Certificate of Need, Medicaid and Medicare reimbursements, managed care implementation and much more. FHCA members' active involvement in our legislative initiatives is critical to our success - no one can replace their grassroots voice and the effectiveness they have in addressing the local issues and concerns of the long term care profession. Please take time to watch this video, which is an effective tool for communicating important long term care priorities with legislators and legislative candidates in the coming months. Governor Scott's recent approval of HB 787 will have a positive impact on the referral process for persons seeking senior care and services options. Effective July 1, 2012, the new law clarifies that certain referral and marketing services that help consumers find appropriate care and housing options do not violate statutes as long as the referred consumers are not Medicaid recipients and/or the referring agent or employee identifies themselves as representing the assisted living facility (ALF). HB 787 also green lights monetary rewards for facility residents that may refer a friend. FHCA's ALF members only may click here and review s. 429.195, F.S. for full regulatory guidance on this new exemption.